Mum's still the word on the arrival of Samsung's next Galaxy S device, but that hasn't stopped fans from speculating. The latest? 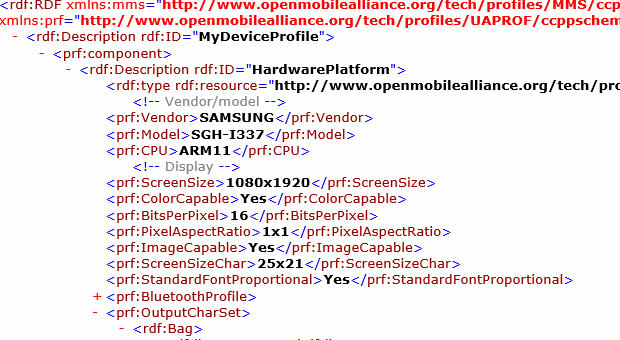 A user agent profile for an SGH-i337, a Samsung manufactured handset boasting a 1080p display. The UAProf reveals little else about the device, but its lame 1337 naming convention playfully suggests something impressive is coming our way. The Galaxy S IV, perhaps? We're not quite ready to make that call -- but Sammy has to do something with that new Exynos chip, doesn't it? Read on for a peek at the user data yourself, or take a gander at the whole thing at the rightmost source link.